A fully machined Redington CD reel. A great value!!! Try the new Redington Brakewater Series reels for you next salt water trip. 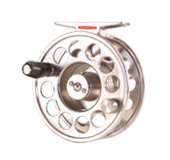 This is a value packed reel that offers corrosion resistance. It is available for line weights 8-12. The 8 wt. balances well with our new Tailwater Series rods. For lighter weights, try their CD Series. These are fully machined reels with disc drags starting at just a little over $100. By being a distributor for Jim Teeny lines, we can offer you a complete package that will take you from Belize to Alaska, or anywhere in between. Teeny's Flip Pallot series lines will serve you well in the Tropical sun chasing bones or Tarpon. The Lefty Kreh series will let you shoot line to that scrappy smallmouth. For all around trout or freshwater applications, try the Gary LaFontaine Professional series line. This line will barely ripples the surface of slow moving spring creeks. Their T series will take your fly down to where the Alaskan Kings lurk or let you shoot the line into the surf for that Barnegat Bay Striper. Anywhere you want to go and anyway you want to fish, there is a Teeny line to suit your needs. Check out the complete offerings of Redington at Redington.com and the full range of lines offered by Jim Teeny.